This is the ArCHbookstore. ArCH will be adding more books over the coming months and years. Click on the bookcovers that appeal to you to be taken to that product page to buy and/or download for free, based on the terms for each title on its product page. This e-book is a free download. 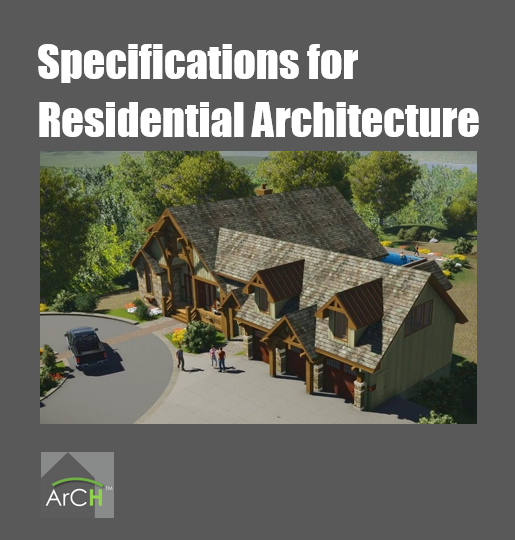 It is written from the perspective of an Architect to other Architects, explaining why they might wish to consider including specifications in their residential project Construction Documents. A brief history of specifications through the ages is included, along with compelling reasons to provide specifications for ALL projects, both commercial and residential. This book is an electronic book, 45 pages long. You download and read on your computer, iPad or SmartPhone. Or, you are welcome to print the e-book in hardcopy if you wish. You are encouraged and allowed to forward this e-book to others, particularly Architects who design homes.